Knowing how much I loved my Baby K’Tan carrier for wearing Charlie when she was a little chunk, when I saw that they had a diaper bag in their line I just had to try it. 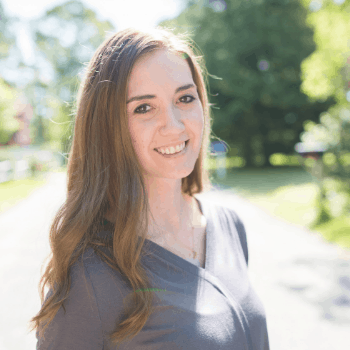 I was intrigued by something that really set it apart from other bags—read on to find out what! Baby K’Tan graciously sent me a complimentary diaper bag to review, but all opinions are my own. This post may also contain affiliate links. See my disclosure page for more details. I’ve been taking the Baby K’Tan Diaper Bag out around town lately, and I have to say, it is living up to my expectations. It has been great for taking to events, storing stuff in the car, and tagging along on trips to Target. It is a good size without being bulky or overwhelming, and yet it holds as much as Mary Poppins’s bag. 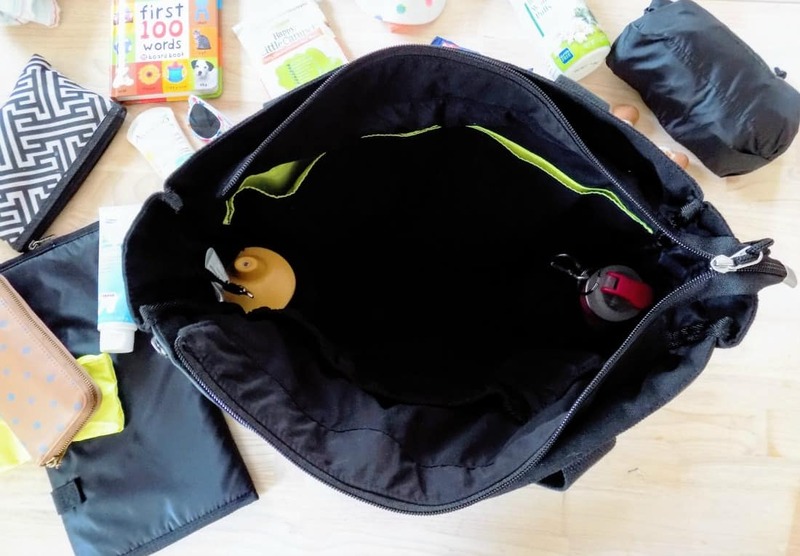 The soft structure of the bag makes it extremely flexible for fitting a ton of different things inside, and the bag itself is designed to keep all of that organized because it has 14 pockets…. and I love me some pockets! Additional interior pockets for increased organization. Built-in Wet Bag- So Cool! 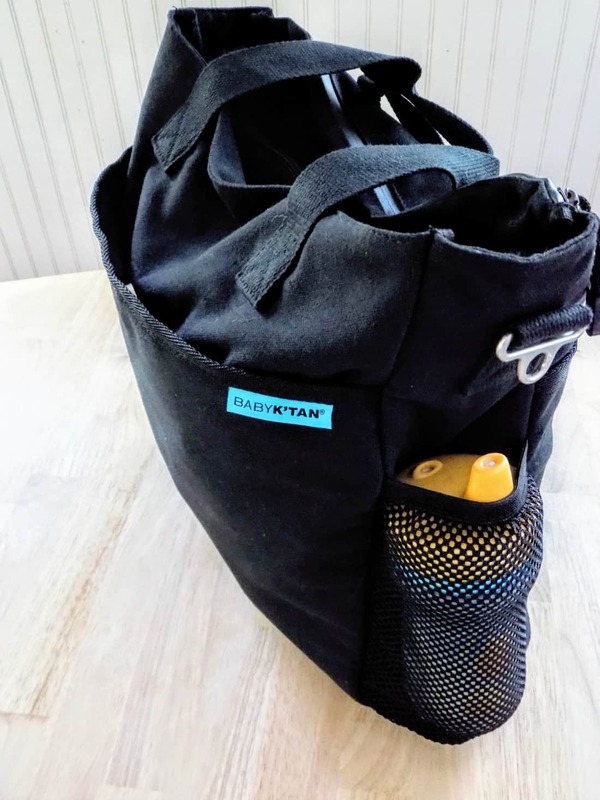 The Baby K’Tan Diaper Bag is the only diaper bag out there that features a built-in wet bag that is not only made with an anti-microbial lining, but is FDA food safe and ODOR PROOF as well. 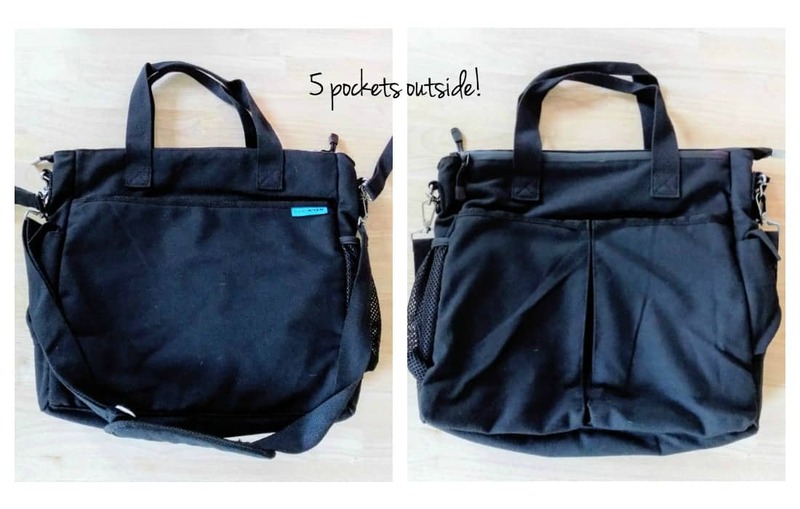 When I first heard about that pocket I assumed it would be a small section to fit messy diapers or soiled clothing on the go. I was not expecting it to be so big! It takes up the entire length + width of the bag, and is so deep that it can hold much more than it seems. If you are a cloth diapering mama, this bag is a dream for you. 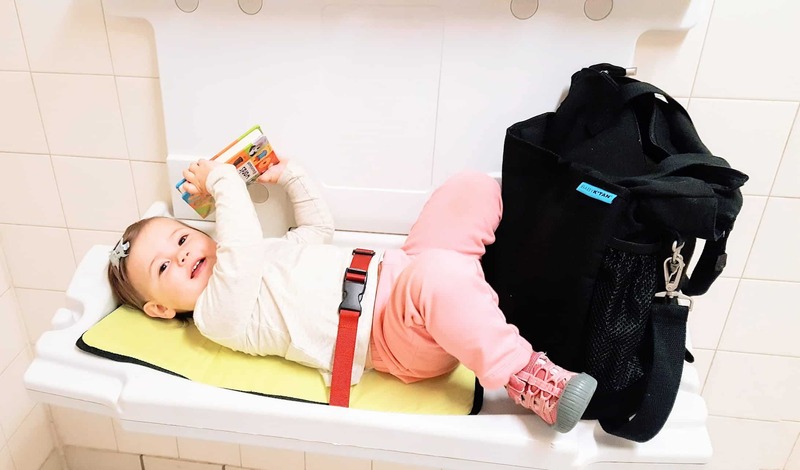 The wet bag can easily handle multiple cloth diapers, wipes and clothing. I don’t do cloth diapers (but admire those who do!) but that doesn’t limit me in using this bag. I am able to put dirty clothing and diapers in there as needed (anyone else’s doctor’s office not allow you throw away dirty diapers there???) and I like that the lining acts an odor blocking agent. The wet bag is water resistant, and will also be perfect for taking to the beach this summer. I always end up throwing swimsuits in a plastic bag and then tossing them in a diaper bag where both get a bit musty. But with this bag I can just toss in damp clothing and not worry about a thing. If I’m to be honest though, I’ll probably end up using the pocket to throw a bunch of food in… both Charlie and I love our snacks! I could fit a whole picnic lunch in there if I wanted to (and I can’t wait to try that!). You might be thinking, storing food where dirty diapers can also go? Gross! And that is my fault because I forgot to mention that this bag is machine washable. AH-Mazing! 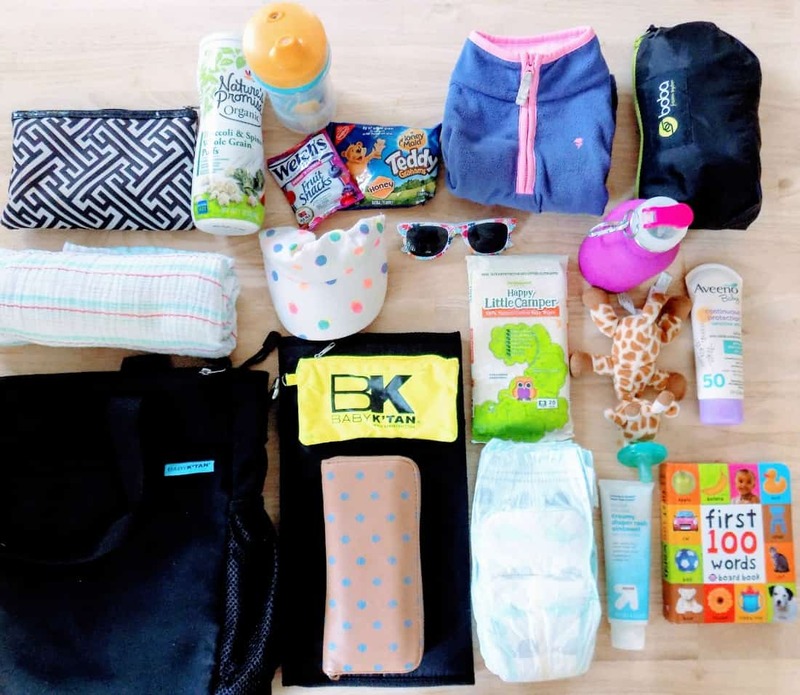 How much does the Baby K’Tan Diaper Bag hold? Even with all of that in there, there was still plenty of room for other stuff (I didn’t even have anything in the outer pockets in that first picture of everything in there!). This bag is incredibly deep, and you really could fit anything you wanted in there. Actually, it is so deep in fact, that I totally forgot I had put bug spray and a bottle of water in the bag one day, and found them a few days later in the inside pocket and at the bottom of the side exterior pocket—oops! Made sense why it felt heavier those days! One thing I like about the bag is that when it is full it doesn’t seem bulging or clunky at all, and when it is only partially full it flattens so it doesn’t take up as much space as a more structured bag (also helpful for squishing it into stroller baskets). While I like the black I do wish, however, that the interior was a different color. Since the bag is so deep, it can be hard to see down into the very bottom. In fact, when I first got the bag I couldn’t find the insulated pockets for a while, because they were closed on the inside. See them below? The other color options for the Baby K’Tan diaper bag wouldn’t have this problem though, since they are lighter colors. 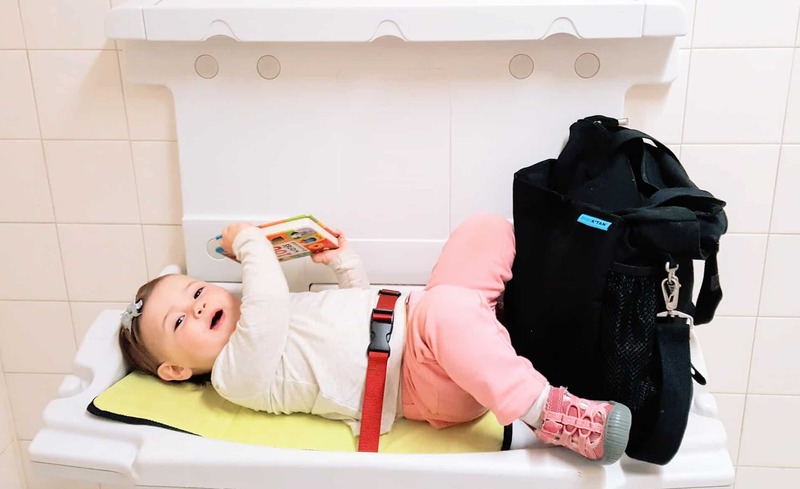 The Baby K’Tan bag has a ton of really great qualities, and would be a great choice for any parents. However there are a few things about the bag that, while not negatives in any sense, are things I wanted to tell you about as part of my review (because mom friends are most helpful when they are honest!). 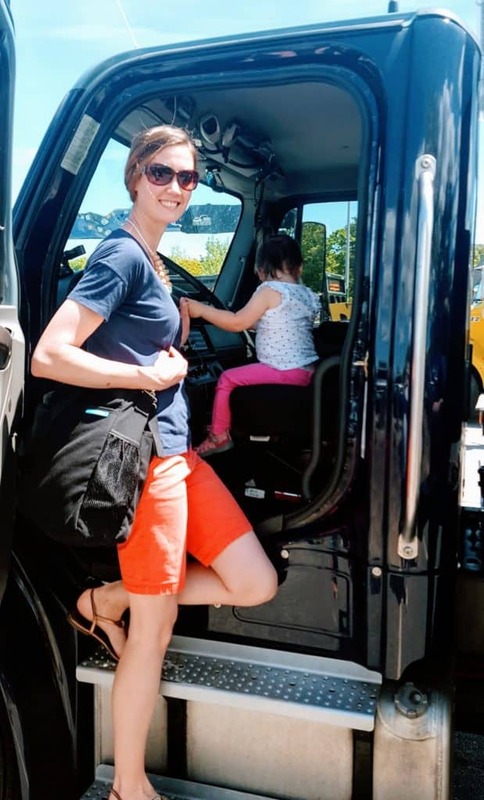 I chose the black bag because I thought it was a neutral choice for travel and because my husband would feel comfortable using it too (great benefit!). The bag is made of 100% cotton material that feels almost like a strong canvas, and so it is gender neutral and less “fancy” than other options. This makes it great for sharing with a spouse or partner, but doesn’t necessarily go with dressier outfits. The fabric also picks up light colored dog hair pretty easily and since we have a pointer mix I seem to bring a least a little dog hair with me wherever I go. 2. The diaper bag comes with two carrying handles, a shoulder strap to carry over the shoulder or messenger style, and stroller straps. The shoulder strap is nicely padded and comfortable, but I do wish the carrying handles were a bit longer. I like to carry my bags on my shoulder like a tote a lot of the time (personal preference), so when the bag is full the handles feel a little tight when carrying it that way. And while I LOVE that there are stroller attachments, I wish they had snaps on them. I currently have a stroller with one bar handle, and these straps are designed more for use with umbrella style handles (2 separate handles). I can however use the messenger strap over the stroller, so the point is basically moot. I should note I’m also really tall (5’11), so the handle length might be a height thing since too long of handles wouldn’t work for people of shorter heights. So is this bag a winner? I think this is a great bag to own, and is very practical for so many different situations. 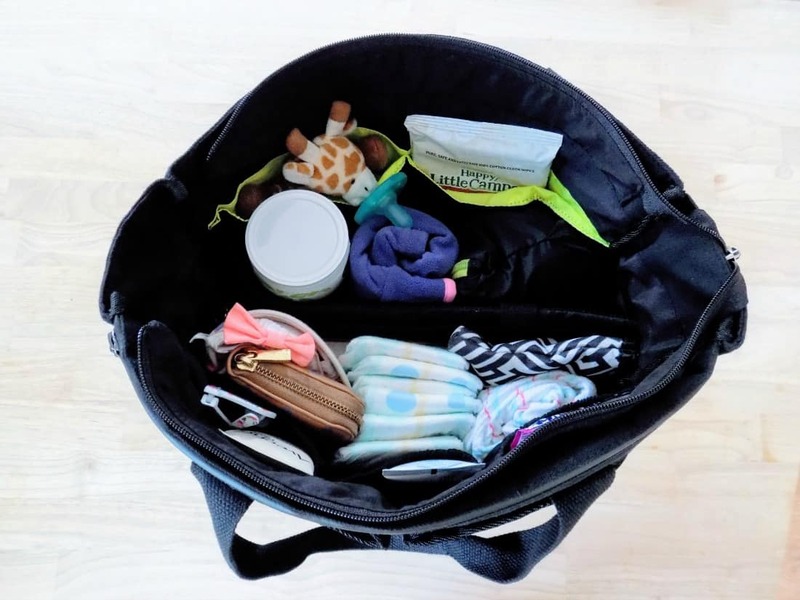 It can easily be your only diaper bag, or it can be a welcome addition to a bag collection (because I have to assume that there are other Mamas out there who LOVE owning different diaper bags for different types of outings or travel like I do!). 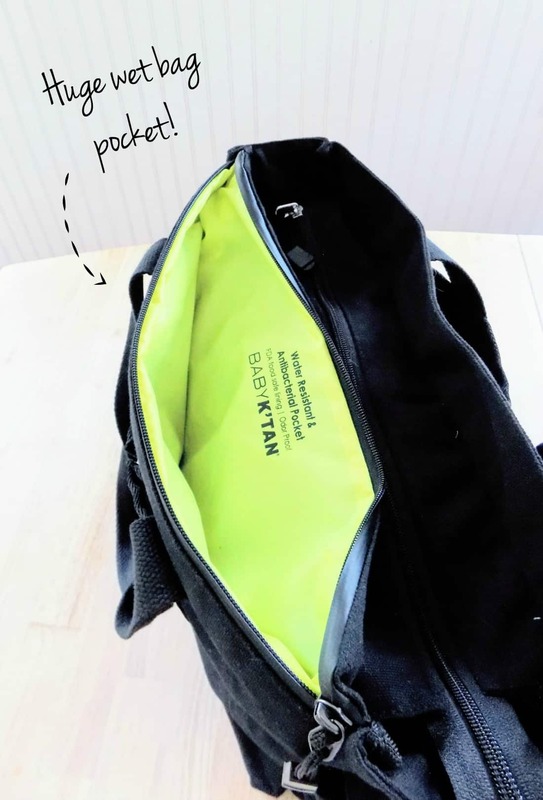 The folks over at Baby K’Tan have done a really nice job putting things that moms on the go need into this diaper bag. You can find it on Amazon—the black is on sale too as of posting! Do you have any questions about the bag? What would you use that wet bag for? Let me know in the comments below! Such a great bag! You can fit so much in there. I really love the built in wet/dry feature. I had no idea they made a baby bag. They had me at built in wet bag. I love the large number of pockets too. Awesome!!! Now that is a bag I know my husband would have no issues about carrying.